Select – the button that is a joy to use. 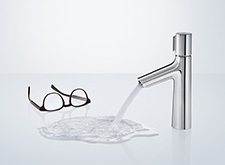 Launched in 2011 in a collaboration between hansgrohe and Phoenix Design, this purely mechanical button was initially designed to make daily showering a more comfortable experience. The jet and shower selection at the touch of a button was a feature that spontaneously enthralled bathroom customers all over the world. In 2014 the Select button began to create a stir in the kitchen: since then, the clever button has been giving a whole new impetus to kitchen chores. For you this means happy customers and ideal sales opportunities. 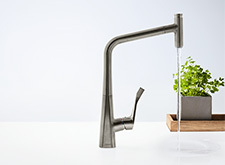 Check out the latest products for bathrooms and kitchens here. Thanks to the Select button, your customers can now enjoy ultimate ease of use at the wash basin too. With its clear design, space-creating character and four jet types, Rainmaker Select creates highlights in modern bathrooms – and is setting trends in the project business. Your customers can enjoy the ultimate convenience of controlling this new XXL overhead shower with glass spray disc on the thermostatic mixer. Exposed or concealed installations alike: the Select button adorns innovative thermostatic mixer solutions and can control up to four consumers. 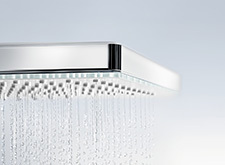 Making your shower more enjoyable, elegant and intuitive. For design enthusiasts and anyone thinking about creating a multi-generational bathroom. 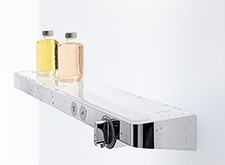 Intuitive ease of use, responsible use of water, functional clarity: hansgrohe is bringing out two bathroom mixer ranges featuring Select technology for the very first time. 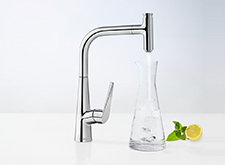 Here form and function blend together, while the lever disappears altogether. Your customers operate the mixer selectively, at the touch of a button. Intelligent multi-functionality, convenience and design at the sink: on the Metris Select kitchen mixer, the Select button controls the water. Extremely resource-friendly. The extra elbow room will also inspire those who love to cook. On this kitchen mixer, the water can be turned on and off in a matter of seconds via the Select button. This makes it both user-friendly and environmentally-friendly. Your customers can conveniently press the button, which is integrated into the slender spout, using a palm, back of the hand or an elbow.